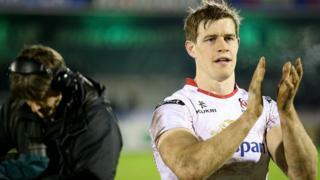 Ulster winger Andrew Trimble says he expects a "backlash" from a "dangerous" Munster side in Saturday's Pro12 interprovincial at Kingspan Stadium. "We must maintain the intensity and level of performance that we have produced over the last couple of weeks," said Trimble, who will make his 200th appearance in an Ulster shirt. Ulster have won their last four fixtures in all competitions, while Munster are on an unenviable sequence of five consecutive defeats.